The Siamese tigerfish is an Asian freshwater fish that is native to Borneo, Indonesia and Sumatra. This omnivorous predator can reach 24 inches in length and requires a large aquarium only to match its large appetite. Datniodes is the name of the genus for this large aquarium fish and there approximately four species known and possibly more. Currently the Datnoides genus consists of the following species D. pulcher, D. microlepis, D. undecimradiatus, D. polota and D. campbelli. 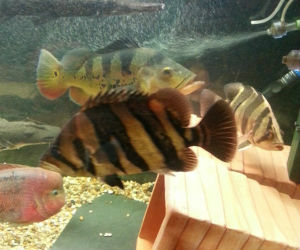 Of these the most two commonly seen are D. microlepis and D. campbelli with the later being more expensive. These fish are not cheap so the smaller you can find them the cheaper they are to buy. Generally their coloration and markings makes them so recognizable which is black vertical bars with either gold or copper colored markings. The vertical are varied on an angle and they taper down being thicker at the top and becoming thinner at the base. This species is kept by many aquarists in a large tank with a community tank setup or to keep one fish as a pet in a large isolated tank. Remember this fish will eat another it can fit in its mouth. It is not uncommon to see this fish mixed with large cichlids or other large freshwater species of fish like Arowana. 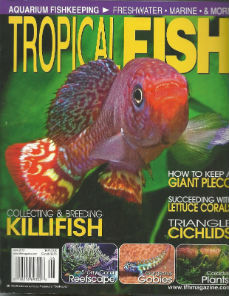 The diet can consist of feeder fish like goldfish, frozen and freeze dried krill or large pellets designed for cichlids or large fish in general. It is important to note that Datniodes pulcher is listed by the IUCN on the IUCN Red List of critically endangered fish. Datnioides pulcher = Widebar datnoid, aka Siamese tiger (ST).